If you've visited Central Queensland's wide open spaces, you'll see that there's often little in the vague, vast distance, but silver grass and long-eared cows. Mango trees are umbrellas of shade as you pull the cotton dress away from sticky skin, wondering where all that perspiration could possibly have come from, since you haven't done a thing. Here iconic homes they call Queenslanders are the lacy ladies of architecture, a legacy to most every Queensland town. There is something quintessentially Australian about this place. It also happens to be central to ... Well, pretty much nowhere. It wasn't just Ivy who thought so. It hit me along with the heat as soon as I touched down. It isn't that Central Queensland is without culture, just that the place is wild, to use an appropriate word. It's a common thing for the fishermen of the Fitzroy to find themselves in the company of crocodiles, see a python curled in a tree or an emu just grazing the plains. For a Central Queenslander, this kind of thing is common place. Seemed I had pitched headlong into red dust and an Australia I had never known. This was when my novel Central to Nowhere was born. The cows, and the homestead? Well, that was homegrown experience. I knew how to pluck a chook and milk a cow with the bucket between my legs. So many of Ivy's experiences I had previously lived. 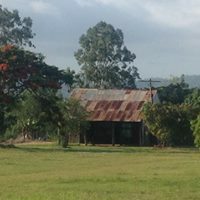 There's something about the west that has inspired authors for years, and in Central Queensland I found a place I could never forget. Central to Nowhere will be released on April 10th by Rhiza Press. You can preorder my rural romantic comedy now and it will be available to order through stores Australia wide, as well as Amazon and all the usual places. When you read this rural romance, I hope you will fall for its wide skies as I have done. Part of me will always yearn to take the road back.